I enjoy everytime I get a chance to shop fresh veggies and fruits in local market. Behaved like a kid yesterday when I caught the sight of fresh peaches. 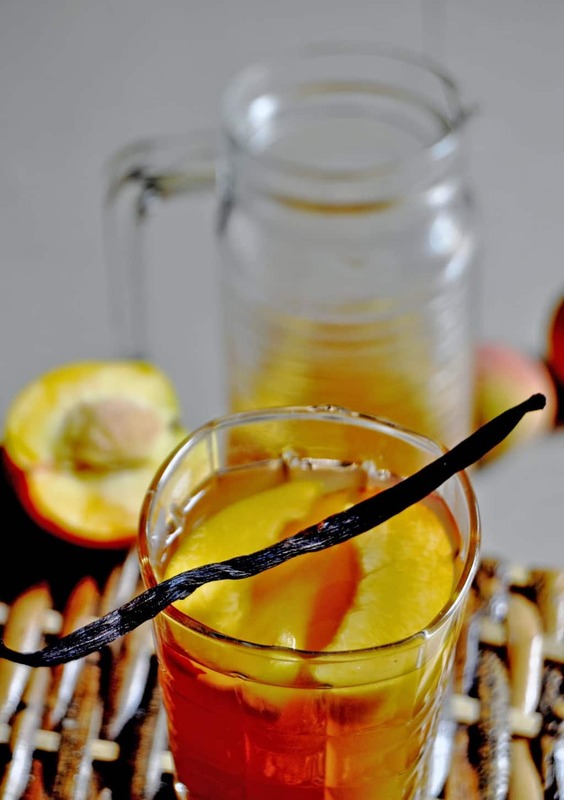 With no delay I planned yesterday itself that my first recipe out of these will be My Favourite Peach-Iced Tea. I personally don’t like powdered iced tea available in market. Always prefer to make it in my own way using different fruit flavour. Also do experiment in changing the flavour of tea. One can try this recipe with jasmine tea also omitting the vanilla pod .I am sure it will give another distinct flavour. Bring 150gm sugar and one cup of water to boil in heavy saucepan. Now add peaches and Vanilla pod split and scraped. Simmer over low heat for 15minute till peaches are soft.Discard the vanilla bean and blend this mixture to puree.